SYNOPSIS: Two extremely rare feature length animated adaptations. Recommended. 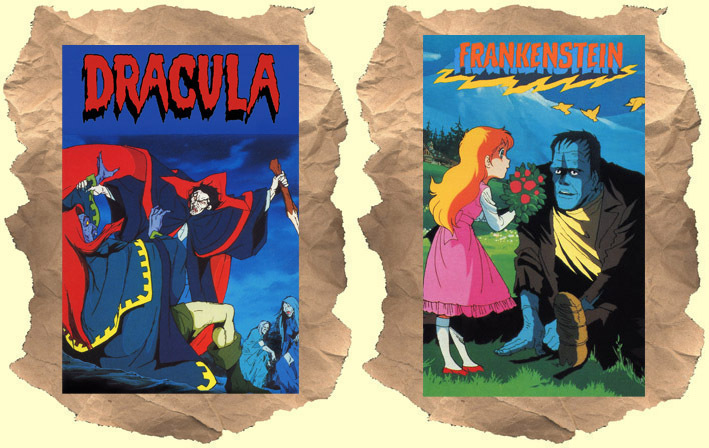 Dracula: Fun animated adaption of Tomb of Dracula. It's cool to see a straight up horror story done in 80's era anime. A girl who was meant to be Satan's bride is snatched away by Dracula. This annoys the devil and he sets his sights for revenge against the ancient bloodsucker. Meanwhile, descendants of Dracula's old foes Van Helsing and Harker are pursuing him as well. All three groups come to an action packed climax. The depiction of Satan is especially memorable. There's a flashback to when Drac was 'Vlad the Impaler', corny humor and even a sequence in Hell! Frankenstein: Adaptation of Monster of Frankenstein. This one is more violent than the Dracula film above. Dr Frankenstein brings his collection of body parts to life. The creature attacks him and ends up falling off a cliff. The Doc is scared to death what his creation will do and if it will return to kill him. One character's eye pops out when the creature squeezes his head! A small blonde girl befriend's him after he kills a bear that attacked her. There's also a bathtub filled with blood, a gruesome neck snapping and a nightmare sequence. Some really great moments of animation with lightning bolts, fire and night time scenes that are filled with garish colors. This one isn't for the kids.